I’m still alive, drawing, and making podcasts! Hey all. It’s been a while, right? But I assure you I am very much alive and hard at work on comics and such. I’m nearly done with a 24 pg mini-comic for this November’s LUTEFISK SUSHI E show at ALTERED ESTHETICS (which, if you are a MN cartoonist, you’re welcome and encouraged to be a part of too!). The downside to this, of course, is that since its being done special for the show I can’t post any of it here. BUT BUT BUT shortly after I finish that I PROMISE I will get back to posting content–and an ALL NEW STORY–here. I’m going to finish a graphic novel I started in January over the next year or so and will start posting pages here once a week SOOOOON! Promise!!! In the twenty-fourth episode host DANNO KLONOWSKI speaks with Matt “SHLOGGS” Risnes . Despite the fact this podcast is the audio sampling of MN Cartoonists, SHLOGGS is in fact NOT a cartoonist, rather Shloggs is one of Danno’s oldest friends on earth. In addition to that honor, Shloggs is an avid film aficionado, as well as a blogger and frequent and sought after film podcast guest who, rather than filling the internet with nerd rage, fills his blog posts and podcast appearances with eloquent logic and critical thinking about the medium of filmmaking. That in mind, Danno and Shloggs spend this episode breaking down and discussing their favorite (and least favorite) film adaptations of comic books. Shloggs provides the insight into the filmmaking and Danno discusses the ways in which being either faithful or disrespectful of the source material can make or break a film (depending on the film, obviously). SPOILER ALERTS!!! If you have not seen the recent DARK KNIGHT RISES or AMAZING SPIDER-MAN (and good for you on that one), we discuss key plot points. Other films discussed include: SCOTT PILGRIM vs THE WORLD, BATMAN ’89, The HELLBOY series, the recent Marvel films including AVENGERS, THE CROW, and several more. 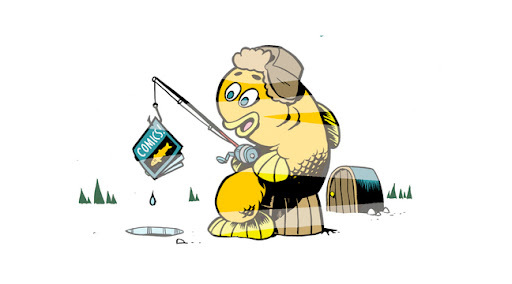 In this Lutefisk Sushi Podcast SPECIALSODE host DANNO KLONOWSKI walks you thru the process of submitting a mini-comic for the LUTEFISK SUSHI E show (submissions due: SEPTEMBER 15th, 2012). It’s not too complicated. The International Cartoonist Conspiracy of MPLS/STPL are inviting MN cartoonists to take part in the 5th Lutefisk Sushi bento box/mini-comic/art show extravaganza! Make a mini-comic no bigger than 5.5″x8.5″, submit 160 copies of that comic (and original artwork) to ALTERED ESTHETICS GALLERY, and then come have a blast at the opening on FRIDAY, NOV 2nd, 2012! So either read what you just did and follow the link the LUTEFISK SUSHI E website for more information, or listen to Danno ramble on it about for 13 minutes. The choice is yours, but might I suggest you start drawing, Minnesota!!! LUTEFISK SUSHI E promotional image by LSE featured artist ZANDER CANNON. In the twenty-second episode host DANNO KLONOWSKI is joined live for a panel recorded at the recent Springcon in St Paul by JUSTIN SKARHUS of 2D CLOUD, BRAD McGINTY, and previous Sushi Podcast guests ZANDER CANNON, and LUPI McGINTY. Unlike previous one-on-one creator talks, this episode instead gets rather meta as we discuss the very notion of comic book conventions, what it means to be indie creators tabling fandom shows, and if in this age of interwebs and kickstarters if comic cons are even a relevant outlet and necessity for getting our work to the masses. Since it was recorded live at the con in a ‘room’ made up of cloth partitions there is plenty of ambient con noise, and you, the listening audience, will feel like you were really there! Thanks to Nick Post and the fine folks at the MCBA for making this possible! MIX is this weekend! Mexico drawings! The Lutefisk Sushi Podcast! YES!!! MIX is THIS WEEKEND!!! Saturday Now 5th & Sunday Nov 6th (with kick-off events on Friday Nov 4th)!!! You WILL be there!!! As I’ve mentioned the debuts of both the MANLY TALES OF COWARDICE and SUPERMARKET VIGILANTE graphic novels will be there, as will the debuts of the GERM WARFARE and DUH! anthologies I have stories in. There are lots of cool panels going on during MIX, including the SALON SALOON show which I will be a part of!!! I love SALON SALOON so being asked to be a part of it is one of the biggest honors ever. Not only that, but the panel includes Lena Chandhok, Corinne Mucha, and John Porcellino–one of the people without whom I would not have even started doing mini-comics. Life has come full circle. So thats all for this week. I’ll be back next week with some kinda MIX recap (maybe. I hope.) and the last of the Mexico drawings. Til then, SEE YOU AT MIX!!! Also, the 4th episode of the LUTEFISK SUSHI PODCAST is up and features a chat with beloved MN cartoonist KEVIN CANNON. Episode 5 will be up later this week and features a tag-team conversation with BOB LIPSKI and BRIAN BASTIAN. Be sure to check them both out, and I’ll see you at MIX! Conspirator, FALSE WITNESS collaborator, and person with whom in 5 days I will be very drunk with in Mexico LUPI McGINTY will finally be debuting her GERM WARFARE book at MIX! GERM WARFARE, an anthology, tells the collected stories (by Lupi, her husband Mark, and others) of Stew and Beryl–a couple of germaphobes with a germ-prone baby. There are also lots of anthropomorphic germs. The image above is from my very sci-fi seven page take on these characters. I can’t wait to see the book! Its been gestating for almost a year now. I recently got to see the cover by ATHENA CURRIER (who will also be having a debut of her own–the collected ACTION ATHENA)and its totally amazing! Lupi is also a co-host of the GEEK REPORT podcast and they will be doing a live show at MIX as well. So yay!!! Lots to look forward too! I’ll see you at MIX! Also: The 24 HOUR COMIC DAY episode of the LUTEFISK SUSHI PODCAST is up now and the next episode–featuring the Beardhero himself–will be up come Thursday.